(22 May 2014) The 18th New Zealand Ice Cream Awards were announced this evening, Thursday 22nd of May, at the Awards Dinner held in conjunction with The New Zealand Ice Cream Manufacturers’ Association’s Annual Conference in Blenheim. Full list of 2014 Awards winners here. 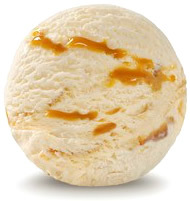 Flavours of English Toffee and Maple Walnut reign Supreme in the 18th year of the New Zealand Ice Cream Awards. This year there was a total of 302 entries, and while the major manufacturers continue to be the backbone of the industry – there continues to be increasing participation by smaller gelato and boutique ice cream producers. This year 32 companies and individuals entered products. The awarding of two Supreme Awards recognises the best ice cream from a Large Manufacturer and a Boutique Manufacturer. This ice cream was Best in Category for Premium Ice Cream and its flavour description of “smooth and luscious with connotations of old fashioned Werther's Originals” was exactly the flavour profile the judges experienced. 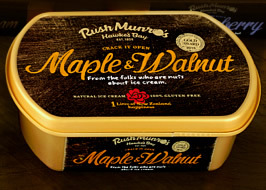 The judges were impressed with the freshness of the walnuts and the balance in maple and nut flavours complemented by a smooth creamy texture. The individual categories which attracted the largest number of entries were Premium Ice Cream with 44 entries, Gelato with 50 entries and Sorbet with 50 entries. These numbers well and truly surpassed the Australian competition held at the Royal Easter Show, so well done to our New Zealand Ice Cream Industry. In the large Gelato and Sorbet categories, the Gelato Best in Category winner was Zuzu’s Gelato Ltd, with their Turkish Delight. The winner of the Sorbet Best in Category was Carrello del Gelato with their Feijoa Sorbet. Emerald Foods Ltd, winner of the Supreme Award for a Large Manufacturer, also won Best in Category for the Export Ice Cream category with their Private Label Japanese Vanilla Ice Cream. The flavour for this year’s “Best of” category was Chocolate. Who would have thought that New Zealand could produce a total of 28 very different chocolate flavours, complete with inclusions such as peanut butter, cookies, truffles and carob. This category has continued to attract large numbers of entries from both gelato/sorbet and ice cream manufacturers. A Dutch Chocolate Gelatomade by Gelatiamo was the winner of this year’s Best of Chocolate category. The winner of the “Best New to Market” category was Zuzu’s Gelato Ltd, with their Turkish Delight. Entries new to retail in the last 12 months were eligible for this award, and 83 of the 302 entries (28%) were eligible! This is positive proof that the ice cream industry is innovative and constantly on the move developing new products for its consumers. Twelve children aged 7–11 years from Mt Albert Primary School were presented with 21 ice creams to determine the winner of the Kids Choice Category. The “Yum” to “Yuk” scale was used with the boys having their clear favourite as well as the girls. 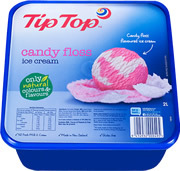 Tip Top Candy Floss Ice Cream made by Tip Top Ice Cream was the winner of the Kids Choice category. Tip Top Ice Cream also won Best in Categories for Standard Vanilla Ice Cream, and the Low Fat category with their Tip Top Creamy Yoghurt Ice Cream Strawberry. Their Boysenberry Ripple Ice Cream also won Best in Category for Standard Ice Cream, and this product has won this category consecutively for the last five years. To challenge the judges, the Open Creative categories in ice cream and gelato/sorbet included some clever and different flavours. In the Ice Cream category these included pandan and coconut meat, red bean and rose flavoured tea, sour cream and peppercorn and chill flake flavours. Equally as creative were the Open Creative Gelato/Sorbet entries with Sage and burnt butter, watermelon and cucumber, kale, mint and apple and Bourbon and smoke. The main judging of the New Zealand Ice Cream Awards was undertaken over two days, 14-16 April, at the Food Innovation Centre, Verissimmo Drive, Auckland Airport. The Chief Judge, Kay McMath and her team of seven judges took two full days to judge the large number of entries split over the 11 categories. The NZICMA would like to thank DuPont Nutrition and Health (Danisco) for their continued support and provision of the Awards' international Judge. Judging involved awarding points for a number of key attributes in different properties. Appearance was worth 10 points, Body and Texture – 30 points, Flavour – 50 points and Melting properties – 10 points. Gold Awards were given to entries with more than 95 points, Silver Awards to those between 90 and 95 points. 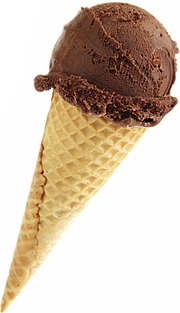 Full list of 2014 New Zealand Ice Cream Awards winners. A full list of the 2014 Awards is here. Photos from the 2014 NZ Ice Cream Awards presentations and Dinner.